I really loved this week’s NXT show. Rumor has it the main roster is ready to step it up, to avoid getting up-staged by the developmental guys. I’m ready to watch, and see if they’re up for the challenge. If they pull it off, this will have been one of the best 9-day stretches of wrestling I can think of, thanks to Chikara, ROH, NXT and, of course, TLC. So, The New Day is here. I’m not willing to make a judgement on it just yet… but I’m definitely worried. This feud is a good start for the group, but it’s not enough of a reason for the crowd to get behind them. We need a little more incite into these characters, their affiliation, and their motivation going forward before we can tell if this make-or-break gimmick change saves three careers…or kills them. 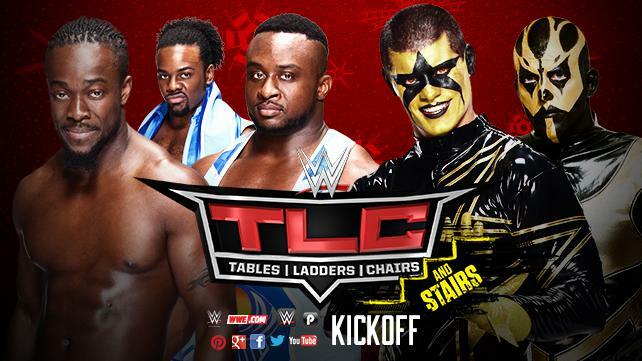 I’ll be angry if: The New Day loses, and if Gold and Stardust (ugh) look like chumps in defeat. I’ll keep my cool if: The New Day win a good, competitive match. What I’m expecting: The New Day wins a little quicker than you’d expect. The Ascension shows up and murders them dead… I’m going to continue to expect this until it actually happens.